We’ll discuss the first two chapters and make plans for future book discussions. Please feel free to bring any books on veganism or animal issues that you’d like to recommend to the group. We’ll meet on the 2nd floor of the public library in downtown Huntsville, in Meeting Room D. Go to the left of the reference desk, and you’ll see rooms on the left side. If you get lost, just check in at the reference desk and they can point you in the right direction. What we choose to eat is killing our planet and us, yet use of the word ‘sustainable’ is ubiquitous. 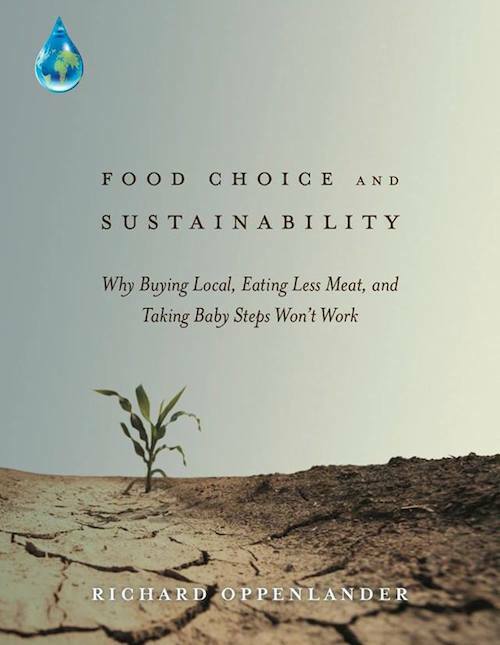 Explanation of this incongruity lies in the fact that sustainability efforts are rarely positioned to include food choice in an accurate or adequate manner. This is due to a number of influencing cultural, social, and political factors that disable our food production systems and limit our base of knowledge—falsely guiding us on a path of pseudo sustainability, while we devastate the ecosystems that support us, cause mass extinctions, and generate narrowing time lines because of our global footprint that will ultimately jeopardize our very survival as a civilization. Dr. Oppenlander’s goal with this book is to increase awareness in order to effect positive change—before it is too late. Speciesism Director Mark Devries Coming to Huntsville!